Keeping these nuisances out of your yard is the best option, but often fencing alone isn’t enough. When you spend your time and money to invest in quality landscaping and fencing, the last thing you want is pesky critters burrowing into your yard and destroying your space. Not only can these critters cause damage to the plants in your gardens, but if they decide to burrow under your home, they can cause severe and expensive damage. Keeping these nuisances out of your yard is the best option, but often fencing alone isn’t enough. When you’re dealing with burrowing pests like rabbits and groundhogs, having your posts buried deeper underground can help keep animals away. Deeper posts discourage them from digging, the deeper, the better. There are several ways to use chicken wire to keep pests out of your yard. To start, having a row of chicken wire along the fence line buried at least 10” deep will help keep digging animals out. You can also use a perimeter of chicken wire laid flat on the outside of the fence to make it harder for animals to begin digging. Chicken wire can also be used to kept climbing animals out by adding a layer on the top that folds outwards, any animal that tries to climb this will have a more difficult time and will likely fall. 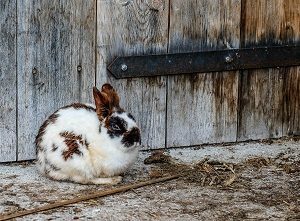 You can find many different types of repellent products for small animals, one of the more common is a “sonic spike” that emits a high-frequency noise, although this doesn’t always work. Some gardeners have had success sprinkling natural repellents like coffee grounds and garlic powder in open burrows. This entry was posted on Friday, November 30th, 2018 at 1:17 pm. Both comments and pings are currently closed.